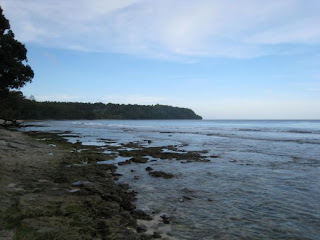 For the last two weeks I have been out on the island of Buka in the middle of the South Pacific Ocean. It is a small island right next to the bigger island of Bougainville, so close in fact that you could probably hit a baseball across the channel that runs between the two. For you Oregonians imagine an area of water about as wide as the Willamette River separating the two. Buka and Bougainville are the main islands of the Bougainville Province of PNG, but there are many small islands and atolls that make up this whole eastern province. 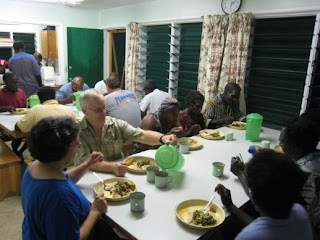 Bougainville Island is just north of the Solomon Islands and its people are more closely related in features and culture to the Solomon Islanders than they are to those who are from the mainland of PNG. Bougainville was also once home to world’s 4th largest open pit copper mine, but civil unrest in the 90’s closed it and it has not been reopened since. So what was I doing in Buka? 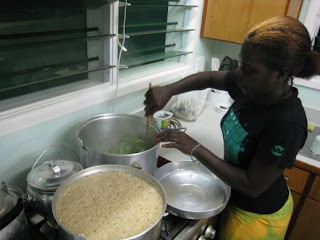 I was managing the kitchen at the regional center that we have there. 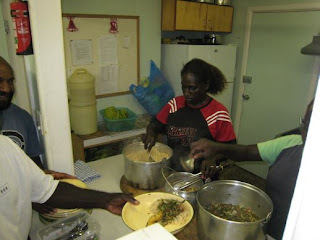 For two weeks a short course for national translators was happening and they needed someone to look after the kitchen staff, buy food, make up menus, make sure the food was served on time and look after the finances of the kitchen. It was really a part time job broken up throughout the day and three times a week I would take the two cooks into town to do market and dry goods buying. I also found a little time to do some of my own things while I was there like walking on the white sand beaches looking for shells, going deep sea fishing, or just relaxing in the warm tropical breezes. It was nice to have the two weeks to unwind and relax while still helping people. The big down side was that Susan wasn’t there with me. 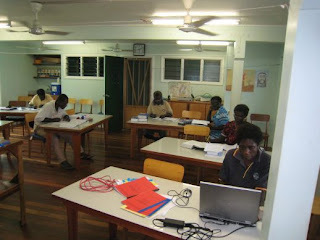 She had to stay in Ukarumpa to do her mentoring for the STEP course that was going on at the same time. However, when the time was over they all asked if I would come out again and that I should bring Susan next time, so I think there is a strong possibility of that in the future. So I will let the pictures speak for themselves. Hope you enjoy! Some of the translators hard at work. There were about 20 working on several translations. 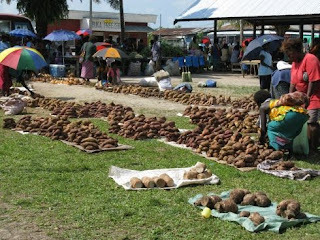 On Buka there are only trade stores like this one for buying dry goods. This one is pink and blue, the colors for a PNG-made ice cream brand called Gala. 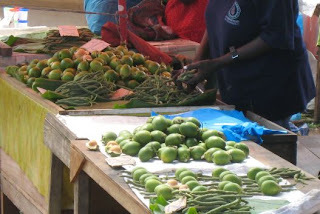 Of course there is going to be Buai (betel nut) at the market! However, these were about three times the size of the normal ones you see on mainland PNG. Also what would the market be without kaukau (sweet potato)? Then serving it. This meal is brown rice, cooked bananas, and kumu (any kind of greens) with some kind of canned meat mixed in. The "wharf" where you catch a boat taxi to Bougainville Island. They also load up cargo of food, dry goods, and whatever else onto these boats to take over since the big ships from the mainland generally only land on Buka to offload cargo. 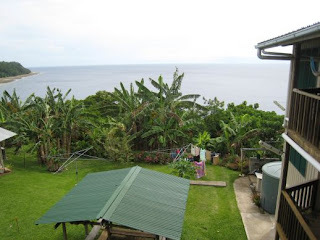 That is Bougainville Island in the background across the water. 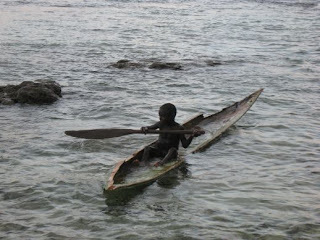 A local boy learning the art of paddling a canoe on top the reef. 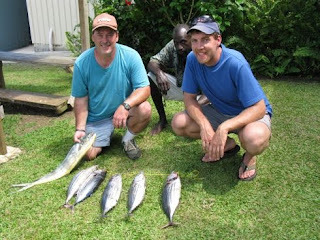 Tommy, Abel and I with our catch of Tuna and a Mahi-Mahi. Paradise? You must be mistaken because it doesn't get much better than Monmouth.